Well, you can scratch another name off the list of most talented online players who've never won a live tournament. One year ago, the shadowy online legend named "Isildur1" was revealed to the masses as a young Swede named Viktor Blom, and now, he's standing atop a heap of chips and cash here in the very same room. After three days of poker played at a very high level, the man known socially as Isildur has climbed to the top of the 30-player field to snag the trophy, the Shamballa bracelet, and the top price of more than one-and-a-quarter million dollars. When play began at 1:00pm local time, Blom was above average but still in the middle of the eight-player pack. He took care of Mike "Timex" McDonald in seventh place when his ace-jack bested McDonald's king-jack, but he was mostly treading water until the bubble burst with five players remaining. Once that moment came and the table began to shrink to a more comfortable size for a man of Blom's ilk, he began to take control. He sent Daniel Negreanu packing in fifth place, winning a race with pocket eights against ace-king to reduce the field to four. 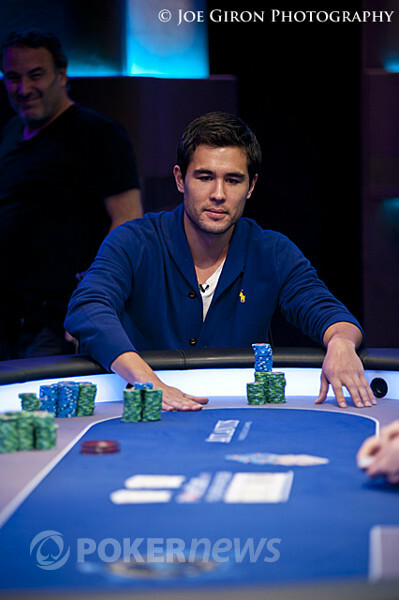 Next up on Blom's scope was the other Canadian, Jonathan Duhamel, and Blom's smashed a flush on the turn of a board to send the 2011 WSOP Main Event champ out with three left. That knockout gave Blom the chip lead, and he and Galen Hall would trade that top spot back and forth for a long while before Blom finally began to gain a foothold. Hours into the three-handed duel, Hall's chips had been whittled down into the danger zone, and Blom went ahead and took care of the remainder. It's hard to fault Hall for shoving with pocket nines and about 30bb, but Blom had a snap-calling hand: . A board full of blanks ended Hall's day just two spots shy of PCA immortality. He'll have a shot to defend his 2011 PCA Main Event title beginning tomorrow, and he's already added about a half-million dollars to his 2012 bankroll. Heads up saw Dan Shak and Blom matched up in a friendly battle that was unfortunately one-sided. Shak won a few small pots, but a few crucial big ones went against him. On the last hand, Blom's top pair held strong against Shak's combo draw with one card to come, and a blank on the river sealed the deal for Isildur. If you've followed our coverage or been here at Atlantis railing, you've noticed a different Viktor Blom than you were used to this time around. Both in looks — he seems a bit more... grown up this year — and in his playing style, which has evidently matured greatly in the last calendar year. If what they say is true, Blom has the potential to be a tournament stud, and this win today might just be the first step in a long and profitable career on the circuit. Or not. If the table talk today is any indication, Blom has no intentions of straying far from his bread-and-butter cash games. He'll likely take those seven figures straight in his PokerStars account, and we wouldn't be at all surprised to find him multi-tabling an hour from now. 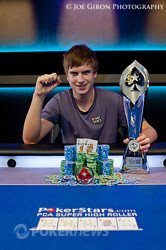 The PokerStars family is thrilled that their boy has done so well, and Viktor Blom is the toast of Atlantis tonight. He's well deserving of the title he's just claimed, and we'll join the masses in congratulating the once-mythical Isildur1 on his rise to tournament poker fame here in the Bahamas. Once again, Joe Giron delivers some beauties that capture the moments of victory and celebration for Viktor Blom. Dan Shak raised to 155,000 on the button and Viktor Blom called from the big blind. The flop was checked by both, landing the on the turn. Blom bet 180,000, but was met with a Shak shove for 890,000. Blom asked for a count before opting to call with . "I have outs," said Shak, showing . Shak needed to catch an ace, eight, or heart to survive, but it wasn't meant to be as the would be the last card of the tournament. Shak's excellent showing earned him $846,700. From Dan Shak to Viktor Blom, with tongue in cheek: "You ever played heads-up before?" Dan Shak raised to 155,000 on the button and Viktor Blom defended his big blind. The flop was checked by both, as was the turn and river. Blom showed , besting Shak's holdings to win the pot. Here's one more round of shots from Mr. Giron; enjoy! Viktor Blom raised to 120,000 on the button and Dan Shak called from the big blind. The flop came down and Shak checked. Blom bet 130,000, but Shak popped it to 330,000. A call from Blom delivered the turn and Shak bet a cool 500,000. Blom stuck around yet again to see the hit the river. Shak kept up the heat with a bet of 700,000, but wasn't happy to hear Blom call immediately. We didn't catch the suits, but Blom tabled for a set to win the pot. Dan Shak opened to 165,000 from the button, and Viktor Blom flatted from his big blind to proceed. The flop came down , and it check-checked to the turn. Blom led out with 180,000 now, and Shak made the call, and the put two pair on board on fifth street. Shak paid off another bet from Blom — 275,000 this time — but his hand was second best. Blom tabled , and Shak rainbow-mucked. As the dealer pushed the pot away from him, Shak spoke up. "You might have been able to win it all there," he admitted. "I had a big ace. I'm not sure I would have folded it preflop." After receiving a walk the previous hand, Viktor Blom opened to 120,000 on the button. 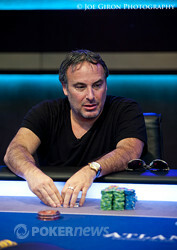 Dan Shak three-bet to 430,000 from the big blind. Blom folded and Shak took it down.